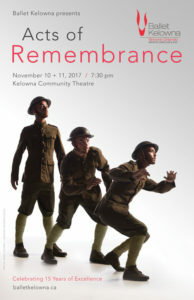 On Remembrance Day Eve 2017, it was a ballet bonanza of bonafide brilliance at Kelowna Community Theatre with one company premiere and two world premieres. 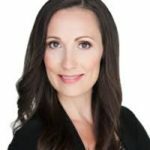 This choreographer’s delight came courtesy of Ballet Kelowna, which on this occasion was celebrating the first production of its 15th anniversary season with Acts of Remembrance. 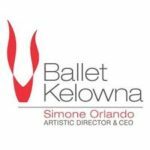 Kudos to Simone Orlando, Artistic Director and CEO of Ballet Kelowna, for assembling such a powerful program featuring nine chiseled dancers and a textured mix of athleticism and storytelling. Not a fuzzy tutu in sight. The show began with the company premiere of L’Etiquette, a humorous ensemble from choreographer Joe Laughlin about Baroque era social conventions with music from Bach, Vivaldi, and Corelli. According to Orlando, the period costumes and set pieces were on loan from Canada’s Royal Winnipeg Ballet. 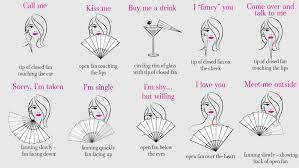 Most noticeable was the “language of fans.” Who knew that with the specific position or flutter of your hand fan you could send a message to a person of interest? Seemed like the Victorian precursor to social media. The second program was a world premiere commission from choreographer Wen Wei Wang titled 1723 – Vivaldi. According to the playbill, it featured gorgeous partnering, extreme extensions, and complex pointe work for the women. What I remembered most was the stark white stage with the dancers in all-white skivvies. The music was very up-tempo and almost something you could boogie to at a downtown Kelowna club. To commemorate the 100th anniversary of the First World War battles of Vimy Ridge and Passchendaele, Orlando premiered Acts of Remembrance. The candid choreography of this program was paired with a projection design of wartime images that recalled the courage and sacrifice displayed in these bitter conflicts. The dancers performed sequential acts portraying a soldier’s story – starting with young men enlisting, going through camp training exercises, marching to battle, participating in battle suffering injuries and losses, post-battle poppies in Flanders Field, and the fortunate few returning home to loved ones. The theatre was about two-thirds filled, but you could hear a poppy pin drop during this entire finale. It was easy to feel the emotion and coarseness of war accompanying the black-and-white photographs and voice narration on the big screen. 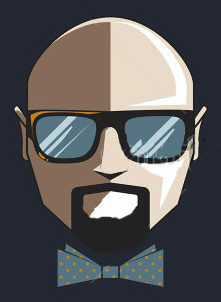 The human experience and medley were created by dance composer Owen Belton. It was extremely well done and elicited a lump-in-the-throat a few hours ahead of Remembrance Day. Big Finish – Ballet Kelowna’s 2017/18 season continues February 2, 2018 with Elles: Extraordinary Dance Created by Women. This show will be devoted to four talented female choreographers. The season culminates with the group’s first full-length ballet, A Streetcar Named Desire, May 1 + 2, 2018, by established Canadian choreographer John Alleyne.